To most Americans across the country, the word “curry” brings to mind the golden yellow spice mixture found in small jars or tins on supermarket shelves. But for those with more sophisticated palates in world cuisines, the word conjures up an array of images of rich saucy dishes, making their mouth salivate with the memory of such invigorating tastes and tingling scents ranging from the Indian vindaloo to Thai red and green curries. 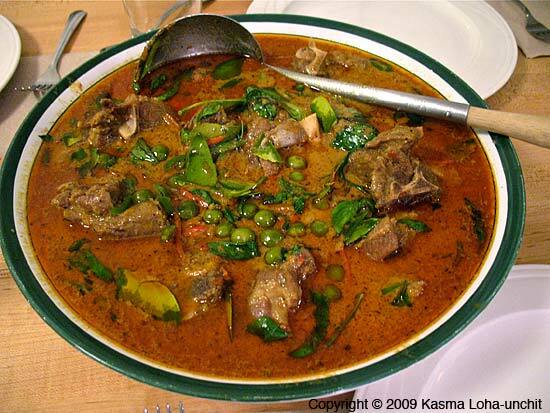 Although the origin of the word could be traced back a few thousand years to a particular spiced food in India, curry has since come to be associated with any kind of dish in which meats, fish or vegetables are stewed in a spicy sauce made with a mixture of dry spices or fresh herbs. Most of them are rich foods, having cream, yoghurt or coconut milk as a base, but there are also very light, though searingly spicy, broth-based curries, especially in the heartland of Southeast Asia. Because of the tremendous varieties of curries that exist today throughout world, I prefer to define curry broadly as a way of cooking rather than any spice mixture or group of finished dishes. 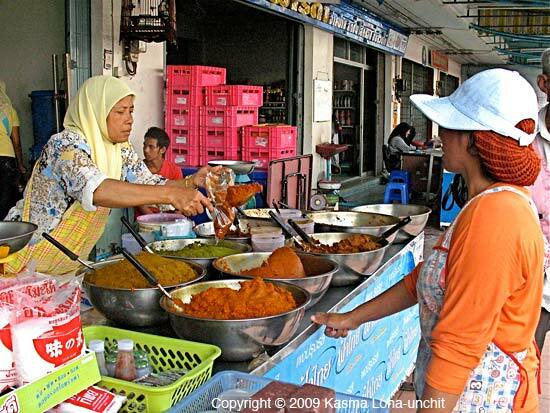 Curry-making, as a way of cooking, was introduced into Southeast Asia by Indian immigrants over the past two to three thousand years, through trade, wars and the spread of religion. While dry aromatic spices from seeds, dried roots and bark figure prominently in Indian curries, they are used sparingly in many Southeast Asian curries. Instead, fresh herbs and roots, stems and leaves, bulbs and vegetables, as well as fish products, constitute the essential ingredients, making Thai, Laotian and Cambodian curries refreshingly herbal, robustly pungent, lusciously tangy and distinctively Southeast Asian. In Thai cuisine alone, there are dozens of different kinds when the several distinct regions of the country with their diverse mix of ethnic peoples are taken into consideration. Each is a unique combination of herbs, spices and preparation techniques that enhance the tastes and textures of particular foods. Some curry pastes are fairly simple while most are complex symphonies of tantalizing flavors. Most have at their core lemon grass, galanga, kaffir lime peel, garlic, shallots and fermented shrimp paste. To them are added innumerable other herbs, roots, seeds and spices in varying proportions to create almost endless combinations. Often the specific herbs that go into certain curries reflect nature’s diversity and the earth’s bounty. The two most common curries are red curry (gkaeng ped) and green curry (gkaeng kiow wahn)), and because of their fresh herbal flavors, they go quite well with seafood. 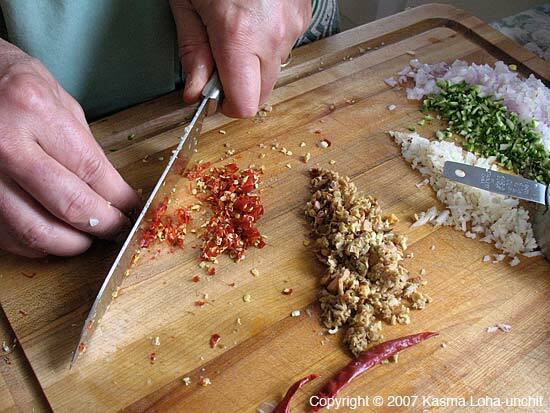 Red curry paste is used not only in making the saucy curry known in many American Thai restaurants, but also in dried wok-tossed curries called pad ped (literally “spicy stir-fry”) and steamed or grilled custardlike curries called haw moek. 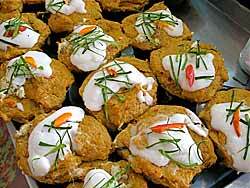 Both are very popular in Thailand and exceptional ways to cook seafood. While haw moek is exquisitely rich with coconut cream and eggs, pad ped is light and intensely spicy – the seafood or meats tossed in a hot wok with a little oil, the curry paste, a profusion of fresh aromatics and little or no coconut cream. Red curry paste is red from red chillies, usually in dried form or a mixture of fresh and dried, giving the curries made with it a fiery red color. Green curry, on the other hand, has a greenish tint from the fresh green chillies and leaves it contains. Green curry paste is a relatively simple paste, made mainly of fresh herbs, whereas red curry paste comes in a number of permutations ranging from simple to complex. Pre-packaged green and red curry pastes come in tin cans, plastic pouches, plastic containers and glass jars in a number of different sizes and brands with varying qualities. I find them to be fresher-tasting and to have a greater depth of flavor than pastes that come in tin cans, mainly because the process of canning destroys some of the more subtle flavors. My preferred brand is Mae Ploy with a good saltiness and nice hot bite. (See Kasma’s favorite Thai brands.) Mae Ploy curries are readily available in Southeast Asian markets. Gourmet grocery stores that carry a wide selection of international foods may sell small jars of specially bottled and labeled pastes suited to milder western palates. Curry pastes keep indefinitely in the refrigerator; but once opened, they gradually lose freshness of flavor. Keep the containers well-sealed and always use a clean spoon to dish out the amount you need. 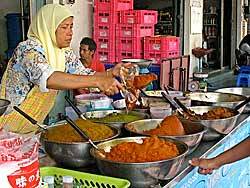 However, none of the pre-packaged pastes compare with the fresh flavors of home-made curry pastes. Some of these made-from-scratch pastes are fairly easy to make and produce wonderfully delicious curries. 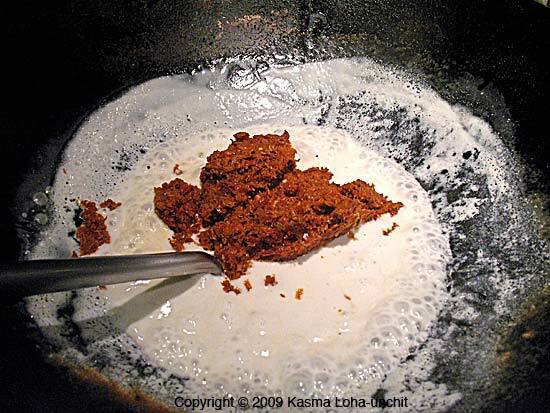 Curry pastes can be made a day or two ahead of time, allowing the flavors to mingle, marry and peak, and although they keep for weeks in the refrigerator (the salt, chillies and garlic preserve them naturally), use them fairly soon before the flavors dissipate, losing the advantage of freshness that makes them superior to store-bought pastes. Most Thai curries are made with coconut milk, but there are a number of very spicy, souplike dishes without coconut milk which we also call curries. 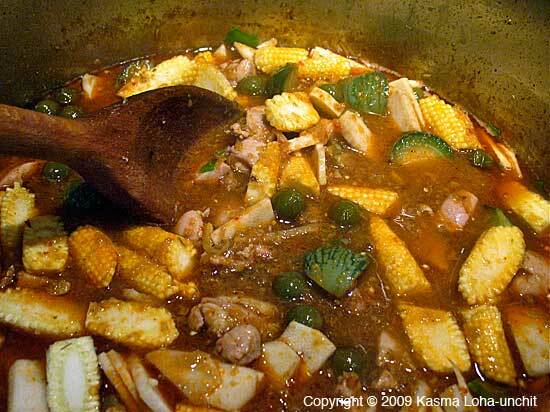 Among them are jungle curry (gkaeng bpah) and sour curry (gkaeng som). Although brothy like soup, they are served more like curries – spooned over and eaten together with plain rice. For accomplishing the task of crushing herbs, a mortar and pestle set is essential. In Thailand, there are several different kinds suited for particular purposes. 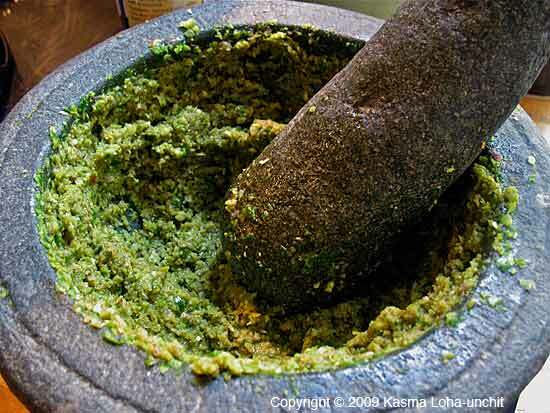 For making curry pastes, a heavy stone mortar and pestle, carved out of granite, is the most efficient – able to reduce fibrous herbs and hard seeds down in no time. The pestle and the inside surface of the mortar are polished smooth and are not rough, coarse or porous like the kind used in Mexican cooking. Very dense and heavy, they do not chip and last for years even when subjected to vigorous pounding daily. Look for this dark-grey stone mortar and pestle set in a Thai or Southeast Asian market. It is available in small, medium and large sizes and ranges from about sixteen to twenty-five dollars. Buy the largest size since you can use it for big as well as small jobs. It also enables you to pound more vigorously without worrying about bits and pieces of herbs spilling all over your work area. This entry was posted on Sunday, March 7th, 2010 at 12:05 am	and is filed under Cooking, Food, Markets. You can follow any responses to this entry through the RSS 2.0 feed. You can leave a response, or trackback from your own site. I spoke to a Thai friend. She said that she spoke to her friends who own a Thai Curry restaurant in Europe about making a green curry. I asked her to. According to them, they grind Sweet basil (Thai) and add it to the paste to make the curry look more green. They also add lemon-grass and galangal. She said they do this because if they used the proper amount of paste then europeans wouldn’t be able to take the heat so they are trying to minimize the heat while trying to keep the flavour and enhance the green colour. Has Kasama heard of this? 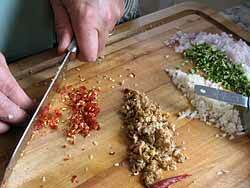 She also mentioned adding green chilli pepper leaves for enhancing the colour and give off a nice aroma. Young pepper leaves. Thanks Michael. Enjoyed the ‘It Rains Fish’ book. I’m going to get ‘Dancing Shrimp’ next. Cheers. Dancing Shrimp is more of a recipe book than It Rains Fishes though it’s got some really good information on Thai ingredients, techniques and general information about seafood. Curry is one of those foods that you either love or hate. If you hate curry,. chances are you haven’t had the right one yet.